Were the 2014 midterm elections historic? Yes. Midterms are always historic when a party takes control of either the U.S. House of Representatives or Senate, as the Republicans did this go around. These midterms, however, are also historic because they broke a 20-year trend set by Republican President George W. Bush and Democratic President Bill Clinton. Barack Obama is the first president whose party lost both midterm elections since Ronald Reagan, when the Republicans lost Congressional seats in 1982 and control of the Senate in 1986. During Obama’s presidency, not only did the Democrats lose each midterm, but they also lost the balance of power both times, with the Republicans retaking the House in 2010 and the Senate in 2014. 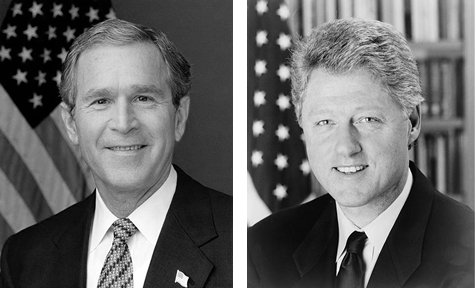 Obama’s immediate predecessors, George W. Bush and Bill Clinton, had better midterm elections, experiencing a split. Both saw their party lose seats and the balance of power in one midterm while claiming victory in another midterm. Both Bush and Clinton also had reasons to smile after a midterm election. The Republicans gained ten seats during Bush’s first midterm election in 2002. With a strong economy and a balanced federal budget backing him, Clinton’s Democrats gained five seats in his second midterm in 1998. The fact that Obama’s party lost two midterm elections is now history. What President Obama does with this loss will determine his lasting legacy. His predecessors’ post-midterm decisions are good ones to follow. After the disastrous 2006 midterms, Bush changed his Iraq policy and his defense secretary, which led to the successful surge of troops that brought more stability to the region. Likewise after losing badly in 1994, Clinton and the Republicans battled over welfare reform until they found agreement in the Welfare Reform Act of 1996. They also eventually agreed on a balanced budget for the first time in 30 years, which gave bragging rights to both parties. Bush and Clinton took their losses on the chin, showed that they’d listened to the electorate, and made changes for the better. Quote | This entry was posted in History, Politics and tagged Barack Obama, Bill Clinton, election, George W. Bush, midterms. Bookmark the permalink.